Satisfaction with Allerdale Borough Council’s services has remained at record levels. 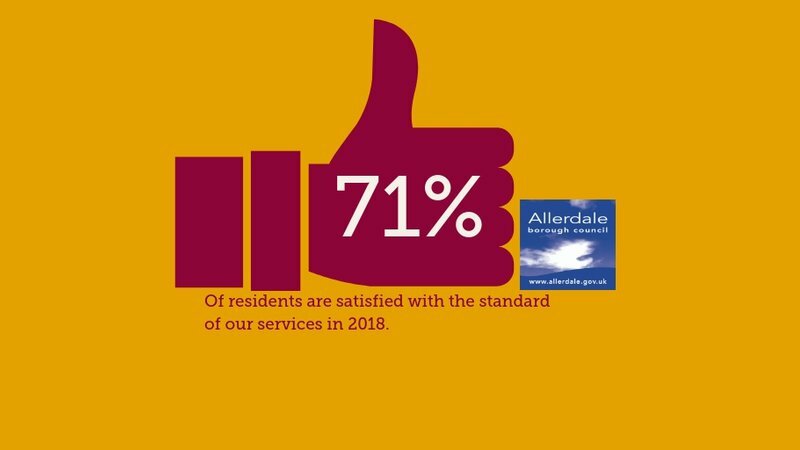 Results from the Council’s latest Survey of Residents have shown that 71% of those who responded were satisfied with the standard of service provided by the authority. This is in line with previous surveys in previous years when with a figure of 74% in 2016. Satisfaction ratings have risen significantly since 2008 when it stood at just 39% and 2012 (49%). The rating also compares well with national figures produced by the Local Government Association (LGA) which showed an average of 61% of residents nationally satisfied with the way their local council runs things. With ratings of 80%, residents in Cockermouth are most satisfied with council services. In other towns the satisfaction levels are Silloth (77%), Wigton (76%), Keswick (72%), Aspatria (69%), Maryport (65%) and Workington (65%). And whilst satisfaction with the way the Council is providing services is high, resident satisfaction levels with their local area as a place to live remains higher. On average, four-fifths (82%) of respondents are satisfied with their local area as a place to live (with a 2% increase in those who are ‘very satisfied’ since 2016). This has remained consistent since 2014 when the figures were 84% and 2016 (82%). People in Keswick are the most satisfied with their local area (96%) followed by Cockermouth (90%), Aspatria (87%), Silloth (85%), Wigton (83%), Workington (75%) and Maryport (74%). The Council carries out its survey every two years. The postal survey was carried out in the summer of 2018 and the results are based on 1,990 responses which are weighted by the size and characteristics of the local population. 93% are satisfied with the Council’s refuse collection services and 78% satisfied with doorstep recycling services. These levels have remained the same since 2016. To meet residents’ demands, the Council recently agreed a new waste contract which maintains a weekly bin collection service, and fortnightly collections of glass, plastic and metal cans. 57% of people were satisfied with street cleaning services, with 68% satisfied with the cleanliness and appearance of their local town centre – a level largely unchanged since 2012. The survey asked how often people used a range of council services. Car parks, parks and open spaces, and household waste recycling services are used the most frequently. Of these services 83% of people are satisfied with household waste recycling sites, whilst three quarters (75%) of respondents are satisfied with the condition of parks and open spaces and more than half (52%) of residents are satisfied with public car parking (up 4% on 2016). There has been a drop in the level of satisfaction with public toilets in the area (30%, a drop of 6% from 2016). The council has tried to rationalise provision and keep toilets open as much as possible, in recent years, in partnership with town councils and local businesses. When asked what services are most important to them, respondents tended to pick cleaning streets and public places (21%) and refuse collections (13%). From 1 April 2019, the Council’s new contract for grounds maintenance and street scene services in combined for the first time meaning a more coordinated approach to the issue to improve the service even more. Preparing for flood events (10%) was also something people believed the Council should prioritise. Providing benefit advice (11%), licensing and land charges (10%), flower beds and support for museums and galleries (both 10%), came out as the services which are the least important for residents. However, the percentage difference between specific services is quite small. When asked, 57% of people who responded would be prepared to see council tax increase to protect the services that are important to them. This is a similar figure to previous years. Some 40% of residents say the Council provides value for money, a similar figure to 2016. Just 23% of people disagree with this statement with 37% not offering an opinion. When broken down by town, residents in Cockermouth (52%) had the highest levels of agreement, followed by Aspatria (43%), Wigton (42%), Silloth (40%), Workington (37%), Keswick (36%) and Maryport (32%). Whilst 31% of people feel they can influence decisions in their local area (up 2% on 2016), the desire to get involved is mixed. Some 27% of people would like to be more involved in decision making, whilst the majority (59%) would get more involved depending on the issue. Many residents continue to shop local, with 84% of respondents saying they go to their local town centre once a week or more. Workington remains the most ‘preferred’ town centre for shopping (37%), followed by Cockermouth (20%). The area’s communities remain strong, with some 73% of all respondents saying they feel a strong sense of belonging to their immediate neighbourhood. Some 90% of people say they feel safe during the day in their area. The survey has reflected a perceived rise in certain types of anti-social behaviour in the area. Some 44% said that “people using or dealing drugs” is an issue in their area (up 11% from 2016); which is followed by rubbish and litter lying around (39% of respondents) and 33% saying “teenagers hanging round the streets” is an issue (up 9%). Noisy neighbours, door step lenders and abandoned cars are seen as much less of a problem. The Council has recently been working with the Police and other partner agencies to tackle these issues, such as at the recent hub event held in the Workington St Michael’s Ward. In terms of basic living costs utilities, food shopping, travel and child care costs have all increased for a large number of respondents in the last two years. Overall 28% believed their financial situation had worsened, with 22% saying it had improved. The majority felt their financial situation had stayed the same. In recent years, the Council has helped those struggling to pay their bills with support for the food bank as well as the local credit union. Notes: The survey was carried out by NWA Social and Market Research over the summer in 2018. NWA is an independent company who sent out the surveys and compiled the results. They used a random sample of addresses from the Local Land and Property Gazeteer. Recipients were asked to return a completed survey, or complete it online (26 people did so). There was a separate option for those who did not receive a printed survey to complete an online version. Eight people took advantage of this and these results were merged with the others. NWA were asked to provide a confidence level of +/- 6% at a locality level. In total some 1,990 responses were received, or 17% of the total number of surveys sent out. The results were then weighted according to demographic and locality data.